Earrings There are 44 products. 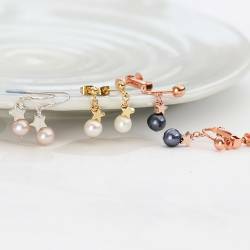 For a classic look with a modern twist, look no further than these contemporary white pearl drop earrings set in a swirl of yellow gold, rose gold or sterling silver. 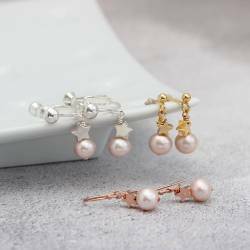 Delicate but still eye catching, these stunning pearl and diamante drop stud earrings give a vintage look to any outfit. A delicate freshwater pearl hangs from a silver stem of diamante leaves. 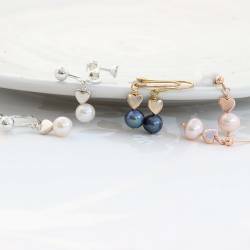 Classic pearl drop earring with sterling silver or rose gold or gold star.They make the perfect jewellery gift for birthdays or Christmas. Or maybe because you are a star and you deserve them. Beautiful and simple, long curved sterling silver earrings with silver wavy dics that move, choose silver or have silver with highlight of gold or rose gold. 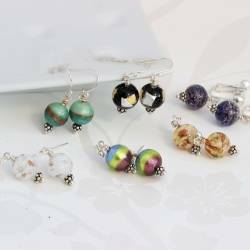 murano glass ball with sterling silver drop earrings on fish hooks, hoops, studs and clipon.A great gift idea and a style that will work for day through to night. 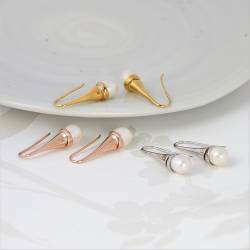 Freshwater pearls in their natural form contrast beautifully with the round symetry of the gold or silver stud. 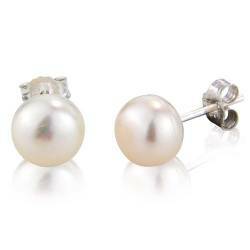 These modern white pearl stud earrings are both elegant and wearable. Rose gold or platinum heart earrings set with pave crystals to sparkle. Unique and contemporary jewellery suitable for both everyday and evening wear. 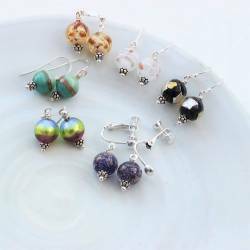 Handmade crystal gemstone teardrop dangle earrings with white freshwater pearl. The essence of chic that can add a beautiful finishing touch by adding sparkle to your day or wear for a glam ocassion. Very modern and glamorous pearl stud earrings, that are a little bit different. Pave cubic zirconia form a shooting star with a freshwater pearl.